For over 400 years our family has lived in one of Germany’s most beautiful wine regions – the Middle Nahe. 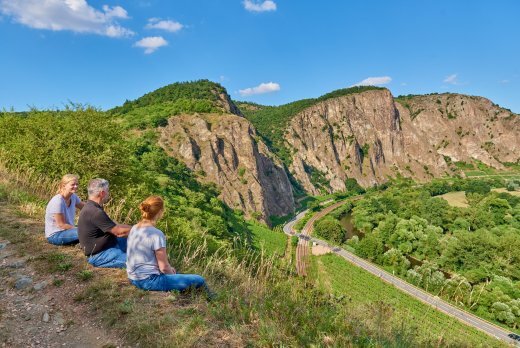 The scenery on this stretch of the River Nahe is noticeably more rugged and varied, the river still meanders in its original bed and the red cliffs of the mighty Rotenfels form the region’s spectacular centrepiece. This unique landscape is our incentive to craft wines that reflect their origins and delight the senses. We’re convinced that the best, most characteristic wines can only evolve in superb vineyards. Which is why part of our success is due to the fact that 70% of our total vineyard area is classified as either VDP.ERSTE LAGEN® or VDP.GROSSE LAGEN®,according to the vineyard site statutes of the VDP Nahe. The vineyards are all located in the direct vicinity of the wine estate (with no vineyard more than 8km away), in the area surrounding our home village of Traisen, in Norheim, Niederhausen and Schlossboeckelheim. We’re convinced that solid professional training and long years of experience in tasting and crafting wines help us make the right decisions in the vineyard and in the cellar. Whether we’re completing the intensive, continuous tasting sessions at the young-wine stage, tackling vertical tastings of different vintages or tasting the wines of our colleagues, we always taste as a team over several days. 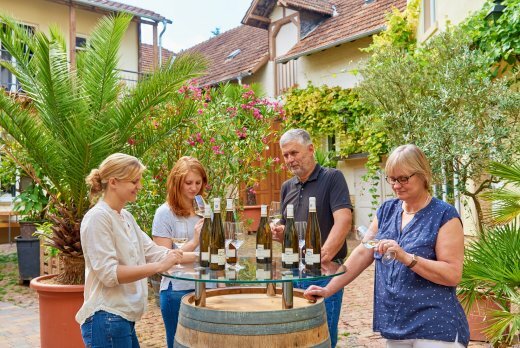 During this process, the extensive experience of Peter & Birgitta Crusius in growing grapes and making wine meets the new ideas and inspirations of their daughters Judith (Sales & Marketing) & Rebecca (currently studying enology at Geisenheim). We think it’s a wonderful combination! We’re convinced that professionalism and passion in one’s day-to-day work creates better wines – wines that reflect their origins to inspire and delight. In the vineyards we pay meticulous attention to the health of the vines. 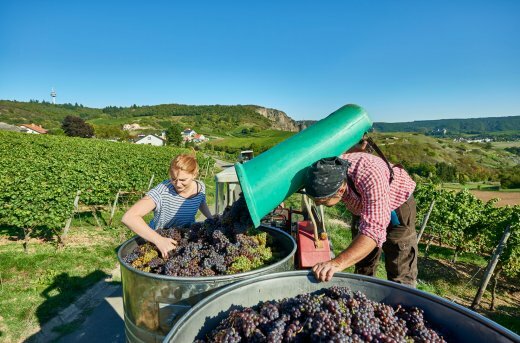 We harvest by hand with only a few, very experienced grape-pickers. Work in the cellar is done with maximum care and flexibility. For us, there’s no dogmatic contradiction between spontaneous and selected yeast fermentation. We use both methods, depending on the vintage and harvest situation. Our approach is equally pragmatic when it comes to the choice of old wooden barrels or stainless steel tanks for aging the wine. But for all the methodology, each year we consciously create space for experimentation and we continually force ourselves to break the rules. Two successful examples of these experiments are the cultivation of Auxerrois and our Riesling Cuvée Top-of-the-Rock.